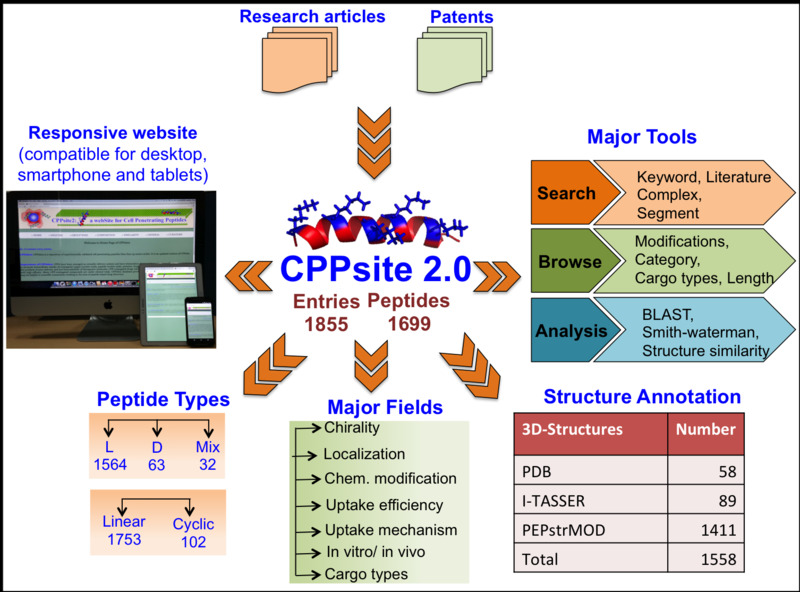 Comprehensive Information: This version contains 1855 entries where each entry provides extensive information about a CPP that includes; i) peptide sequence, ii) nature of peptide, iii) chemical modifications, iv) experimental validation techniques, v) structure of peptides and vi) type of cargo delivered. Searching Facilities: Searching modules allow users to retrieve data from database using various options that includes; i) searching on any field, ii) identical secondary structure, iii) composition/frequency of residues and iv) composition of secondary structure. Group-wise Data Browsing: Modules under this section allow the users to retrieved data in classified manner. These modules allow user to browse CPPs of different categories that include cyclic, synthetic, nucleic-acid delivering, small peptides. Similarity Search: It mainatins primary, secondary and tertiary structure of all peptides; peptide structures were either obtained from PDB or predicted using structure prediction methods (PepStrMod and I-TASSER). 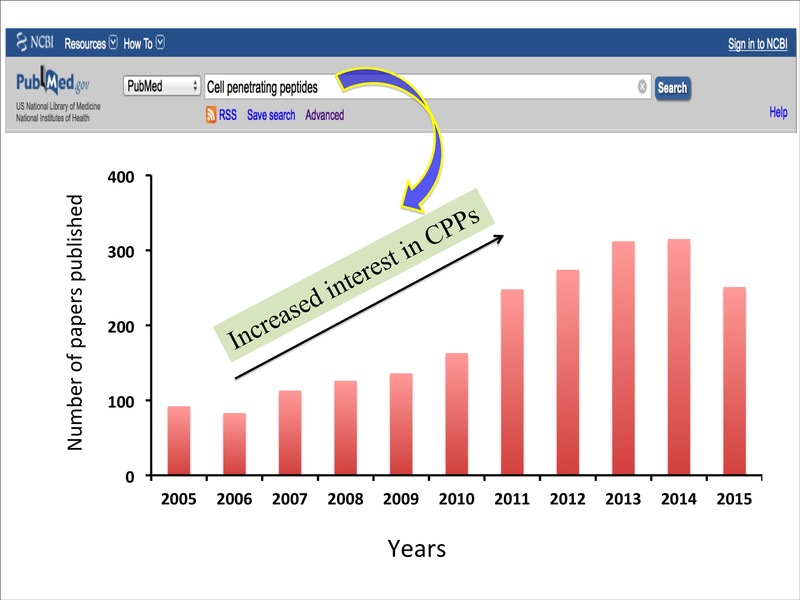 Web based tools integrated in CPPsite 2.0 allow users to perform similarity based search on sequence, structure or composition. Mobile Compatible Website: CPPsite 2.0 is built on a responsive template, compatible for desktop, tablet and smart phone. These templates are dynamic that fit content based on screen size of device. 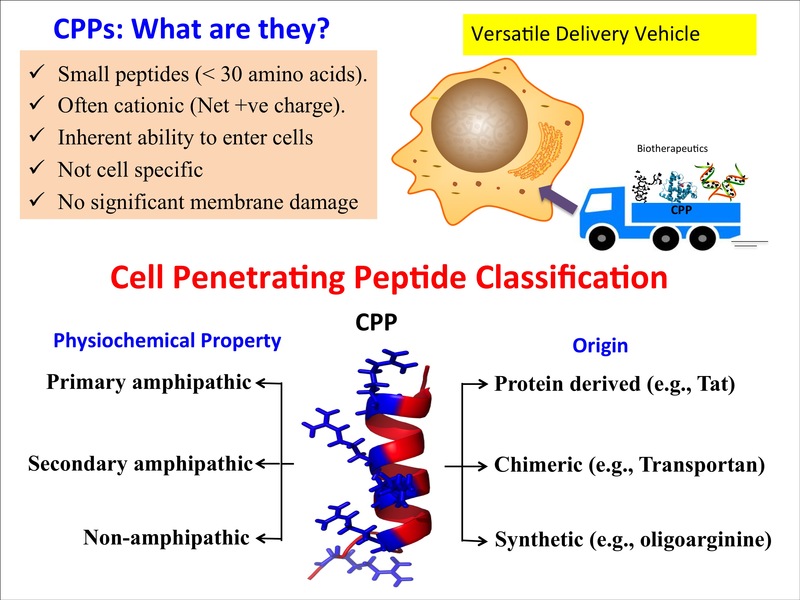 Agrawal P, Bhalla S, Usmani SS, Singh S, Chaudhary K, Raghava GP, Gautam A (2015) CPPsite 2.0: a repository of experimentally validated cell penetrating peptides. Nucleic Acids Research doi: 10.1093/nar/gkv1266. Gautam A, Singh H, Tyagi A, Chaudhary K, Kumar R, Kapoor P, Raghava GP (2012). 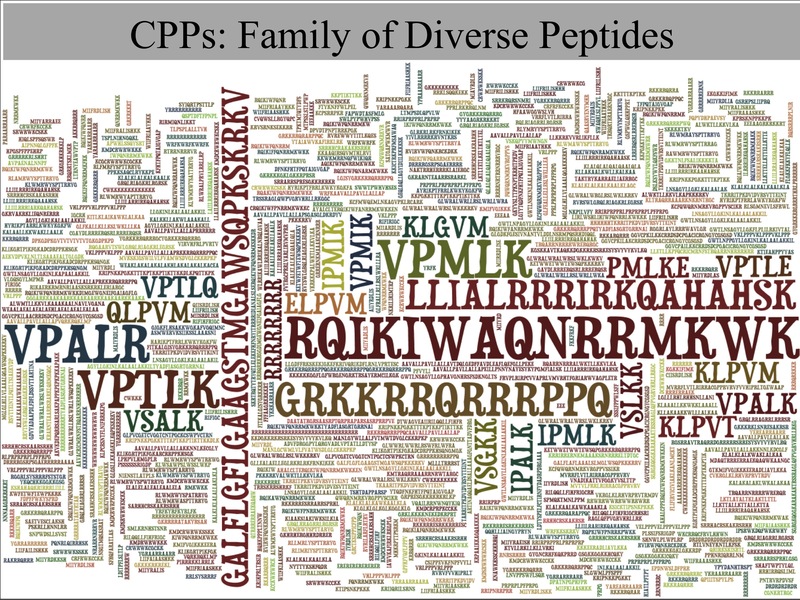 CPPsite: a curated database of cell penetrating peptides. Database (Oxford). Mar 7;2012:bas015.